#ArtAGE #Senior Self Portraits Making Memories…Join Us! Maturity and Its Muse is excited to share ArtAGE with you. 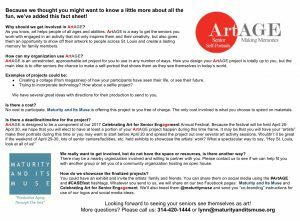 ArtAGE is the new component of the second Celebrating Art for Senior Engagement festival. 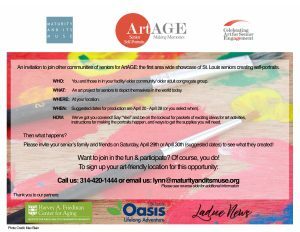 We invite you and your friends, those you congregate with at church, or those you pal with to join others for ArtAGE…the first area wide showcase of St. Louis seniors creating self portraits. Please share this with all you know! Want to join in, but don’t have a group or a location…not to worry…we have community locations set up to welcome you! Here’s hoping I’ll have the opportunity to see you or others you know see themselves as art!